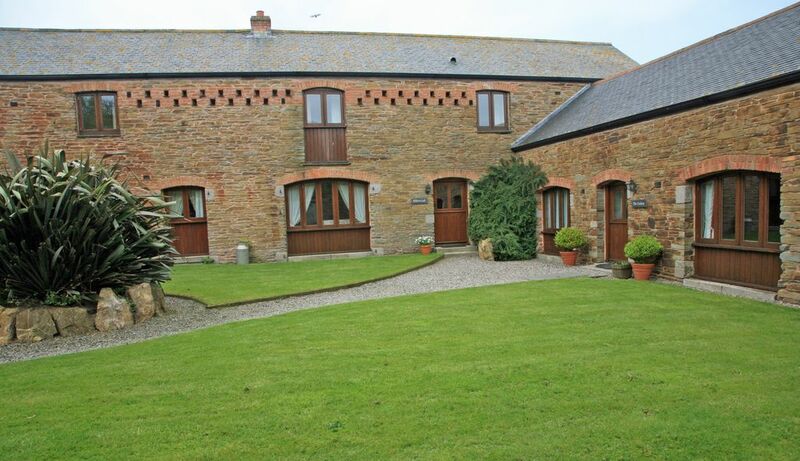 The Linhay is one of our three barns nestling around a courtyard situated on our family run beef farm. The Linhay has 2 bedrooms and can sleep up to 4 people. The ground floor bedroom can either have a zipped and linked bed which makes a super king, or twin beds, with a shower en-suite. The first floor gallery bedroom has a king size bed with en-suite bathroom. The fully equipped kitchen/lounge/diner boasts an open vaulted ceiling with wooden beams, comfy sofas and the French doors then lead you onto your patio area with a shared 2 acre garden and outside play equipment. Mike and Alison Roberts have been welcoming guests for more than 14 years as well as running their family beef farm. Ground floor en-suite shower room. Gallery en-suite with bath. There is your own integrated washer/drier and you will supply your own washing powder. The living room is in the kitchen/dining/lounge area with a 2 seater sofa and 2 armchairs, with tv, dvd player, music system with i pod docking station. We supply welcome tea, coffee, milk welcoming pack as well as surprise welcome gift. 2 acre shared garden area ideal for ball sports as well as outside play equipment. Fantastic location, perfect base to explore north coast. Alison and Mike perfect hosts! Lovely location, perfect base to explore the north coast. Very peaceful and beautiful. Alison and Mike fantastic hosts and always on hand if we needed anything. Great cake too, thank you Alison!!! We are so happy you enjoyed your stay and it was lovely to meet you all. We stayed in The Linhay and it was just lovely. Well equipped with everything you need. We were there during a hot spell and could open the doors to the garden to let the breeze in. Sunsets from the patio were gorgeous. Perfect for my elderly mum with a ground floor en-suite bedroom. Very peaceful and quiet but so close to North Cornwall places to visit, and just a few minutes from Tesco. Would thoroughly recommend. We are delighted that you all enjoyed your stay and it was a pleasure to meet you all. We recently stayed for a fortnight at the Linhay and had an extremely relaxing and enjoyable holiday. It's a lovely little cottage, exceptionally clean, well-equipped and well-maintained, in an incredibly peaceful location; the view from the terrace is beautiful. The owners were friendly and helpful. We left wishing we could have stayed longer. Blable Farm Linhay was spacious, quiet, totally self-contained and in excellent order. Parking was convenient. We were welcomed with a delicious cake. The owners were able to work round our dates as we had traveled from New Zealand and could not do Saturday- Saturday as most places require. Supermarkets on the outskirts of Padstow and Wadebridge were handy and we were close to main roads to travel all over Cornwall. The Saints' Way runs past the property so we were able to walk through fields and hedgerows to nearby villages. Activities included visiting the stunning house and garden of Cotehele, Eden Project, walking from Port Quin to Port Isaac, St Michael's Mount and exploring many historic villages. Highly recommended, particularly for 2 couples as there were 2 queen beds and bathrooms. There was play equipment and plenty of grass for children if needed. We can recommend this house. The garden is big and the kids can Play there. You can visite many nice beaches nearby, play football Golf in St. Austell. We are appoximately 5 miles to the numerous sandy beaches such as Trevone, Harlyn, Constantine and Treyarnon Bay, all popular with surfers and families. The picturesque fishing port of Padstow with its many shops and famous eating restaurants such as Rick Stein and Paul Ainsworth is 5 miles away. The nearby market town of Wadebridge is worth a visit with its many cafes and interesting shops. Crealy Adventure Park is a mile away which offers fun rides for all the family. The Camel Trail cycling Path is 4 miles away and is ideal for all family ages. We are situated in an ideal location to explore the many attractions such as The Eden Project, Heligan Gardens and the National Trust property of Lanhydrock House. Also by car you can explore the stunning North Cornwall coast with places such as Rock, Polzeath, Port Isaac, Boscastle and Tintagel. For those of you who enjoy golf there are numerous courses, but Trevose and St Endellion are very popular being perched by the coast. We are situated on The Sants Way footpath which will take you into Padstow. The stunning South West Coast path offers many amazing walks with the rugged North Cornish Coast. The rate is if you only want the use of 1 bedroom, but if you require 2 bedrooms there is an extra 10% increase on the total rental.